What is the difference between an ethernet cable( straight-through,patch cable) and crossover cable? What is the difference between an ethernet cable(Standard Straight-Through Cable,Patch Cable) and an ethernet “crossover” cable(crossover ethernet cable)? I would like to wire my two computers together so that data could be transferred. Both computers have an available ethernet port. I have additional ethernet cables available.How do these cables differ from the crossover variety? How much should I expect to spend on a crossover cable? If you have a computer network in your home, there isa good chance that at least one ethernet lan cable is involved. It might connect your computer to a router,a modem, a wall socket, or even hook a wireless router up to the outside world. Whatever it does, your ethernet cable is a vital part of your network. However, there is another similar typeof cable that is known as a crossover cable. While it has many similarities with an ethernet cable, the exact purpose of it can be unclear. Crossover cables and ethernet cables, despite theirfunctional differences, have many similarities. In fact, it is easy to mistakea crossover cable for an ethernet cable if you do not know where to look. Thisis because crossover cables are designed to use the same port as an ethernet cable. They have the same number of pins, and the same general appearance.Because of their similarity, it can be hard to tell exactly what the difference between a crossover cable and an ethernet cable is. There are many functional differences between crossover cables and ethernet cables. For one thing, crossover cables havetheir pins configured differently than ethernet cables, even though they havethe same number and connect to the same port. This difference is not very obvious, but it is possible to tell between a crossover cable and an ethernet cable by examining their connectors. This is because the different pins are labeled by color, so the different configuration between ethernet and crossover cables is made clear visually. The difference between configuration of crossover and ethernet cables has an important function. Ethernet cables are for connecting two different types of devices. However, crossover cables are used for networking two similar devices directly, without using hubsor routers. Trying to use an ethernet lan cable in place of a crossover cable will simply not work, and vice versa. Crossover cables, because they are designed to connecttwo similar devices, serve many purposes that ethernet lan cables cannot. For example, you can use crossover cables to connect two network hubs together.This allows you to share information between the hubs, and gain extra portsthat are all on the same network. This is a great way to connect many computers or external devices together, particularly ones without wireless capabilities. However, crossover cables cannot perform the numerousfunctions of ethernet lan cables, which are all very important. Ethernet cables, unlike crossover cables, are forconnecting two different types of devices. This is a much more common type ofconnection, which you will see in almost every network. For example, an ethernet cable could be used to connect a computer to a modem. Alternatively,it could connect a computer to a splitter, which connects to several external devices, such as printers. 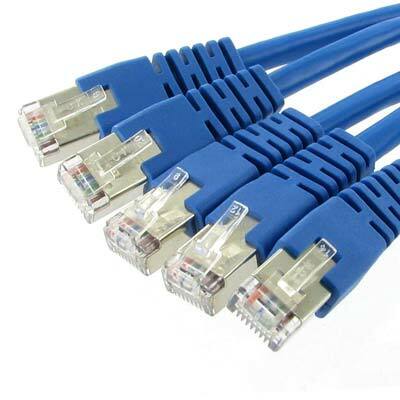 Ethernet cables are very useful and more common than the specialized crossover cable. Ethernet cables are used to connectseveral pieces of a local area network together. Ethernet cables typically comein two varieties: crossover cables and patch cables. Since crossover cables and patch cablesare fundamentally different, each cable has a different function in a localarea network. Category-5, 5e, and 6 cables are assembled according to either the T568A or T568B standard. The T568A standard requires the cable end to terminate the internal colored wires in this order, as viewed from the top, left to right: green-white, green, orange-white, blue, blue-white, orange, brown-white, brown. The T568B standard requires the cable ends toterminate the internal colored wires in this order, as viewed from the top,left to right: orange-white, orange, green-white, blue, blue-white, green,brown-white, brown. terminated in the same fashion, a patch cable is often called a "straight-through" cable. cable to be connected directly to the data input pins on the other end of the cable. directly to each other, without using a network hub or switch as routing device. and switches (32 ports or more) than with smaller hubs or switches (16 ports or less). accessing resources. Aside from the ordinary Ethernet cables, there are also crossover cables, which are basically just Ethernet cables that are wired slightly different. · An Ethernet cable, which is also known as a straight through cable, iswired so that pin 1 on one end connects to pin 1 on the other end; the samewith the 7 remaining pins. With a crossover cable, the connections are not asstraightforward. The pin 1 is connected to pin 3; pin 2 is connected to pin 6,pin 4 is connected to pin 7, and pin 5 is connected to pin 8. · The different interconnection scheme is done in order to divert thetransmit lines on one end to the receive lines on the other end. This is usefulwhen using the cables to connect two computers without the use of routers orswitches. If you use an ordinary Ethernet cable, no communication isestablished as they would be transmitting on the same lines.The crossover cable makes it so that the transmitted signals from one computer get to the receiving sensors ofthe other. These connections are referred to as ad-hoc connections. you attempt to use a crossover cable with older switches. Some of the olderswitches are fixed on what pins are for transmit and what pins are for receive.These switches would work with crossover cables but are okay with ordinaryEthernet cables. 1.A crossover cable is a type of Ethernet cable. 2.An ordinary Ethernet cable is wired straight through while a crossover cablecrosses the transmit and receive lines. 3.A crossover cable can be used to connect two computer without a router whilean ordinary Ethernet cable can’t. 4.A crossover cable can be used as an ordinary Ethernet cable but not the other way around. 5.Old switches can use Ethernet cables but may not recognize crossover cables.